There is a wealth of advice and support for doctoral students at UCL covering academic and professional development, and assistance with more personal issues that arise. There is also support in instances that might require specialist help. The following list is not exhaustive but details the main sources of support, many of which are also there to assist academic and administrative staff in their roles in working with doctoral students. Supervisory Team – key to your academic and professional development as a researcher, your supervisors should be your first port of call for advice and support on almost any matter: if they can't help directly, they can help you find out who can. 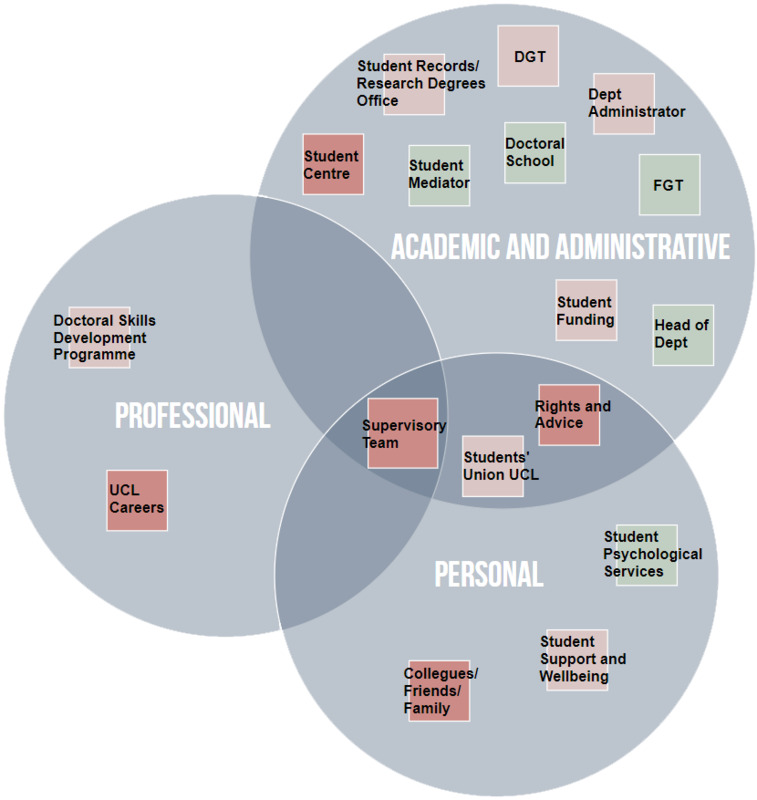 Departmental Administrators – have a wealth of experience to help you navigate successfully through your time at UCL. Some departments have named PhD Administrators, but all will have administrators with detailed knowledge of your department and the administration of your programme. Departmental Graduate Tutors – often referred to by the acronym DGT, each department has an experienced member of academic staff from whom you can seek advice if you need to talk to someone beyond your immediate supervisory team. Faculty Graduate Tutors – each Faculty also has an FGT, a senior academic representing the Faculty. You should feel able to call on their assistance if you wish to seek advice outside your department. Student Centre – a central office for all student enquiries, you can find information for example on admissions, international student welfare issues, research degrees, and changes to your student record. If the Student Centre can't assist directly they will signpost you to the correct person to help you. You can also speak to a member of the Student and Registry Services team in person by making an appointment or attending a drop-in session on a range of issues, for example: funding, support and wellbeing, disability services, chaplaincy services, student discipline/complaints. Students' Union UCL Advice Service – based in the UCL Students' Union building on central campus, the UCLU Rights & Advice Centre is a support service for UCL students and a central point for information and advice on a wide range of issues including: immigration, housing and finance. You can also talk to them about any academic issues you are facing: as part of the Students' Union they are independent of UCL's formal structures. UCL Doctoral School – provides advice to students and supervisors on informal matters concerning the supervisory relationship. Student Psychological Services – is based at 3 & 4 Taviton Street on central campus and provides an accessible and effective professional resource for students who are facing emotional and psychological problems. UCL Student Mediator – is responsible for advising and assisting UCL students with the resolution of complaints, involving staff or other students or services of UCL which the student has been unable to resolve through informal means. The Wider UCL Community and Beyond – ultimately it is down to you to make sure you seek the advice and support you need for making the most of your time at UCL. Don't forget the important support that your fellow students, other members of your department, academic and social networks outside UCL, and friends and family can provide. Student Support and Wellbeing – a team of expert wellbeing, disability and mental health advisers provide a safe, confidential and non-judgmental space, in which you can discuss any issues that may be affecting your ability to study. UCL Student Disability Services – provides information and advice for all disabled UCL students. It organises support services such as note-taking, communication support, mentoring and study skills tuition. Also assists students in applications for Disabled Students Allowance and other funds, and can provide assessments of dyslexia and other learning difficulties. Specialist information and support – information and advice for LGBT+ students, students affected by sexual violation, students transitioning gender, mature students, student parents, care leavers and estranged students. Religion and faith information and support. “Here to support you” – a guide to UCL Student Support and Wellbeing services.